A well-timed discount or store-wide sale can be extremely effective when you need to stimulate revenue and get customers excited about shopping. The downside? All the additional work necessary to keep promotions up to date across multiple campaigns and ad groups. Promotion extensions make it easy to update sales, discounts and promotions, providing many additional benefits. For this section, you’ll need access to the AdWords UI, which, as of July 2017, is still in beta. 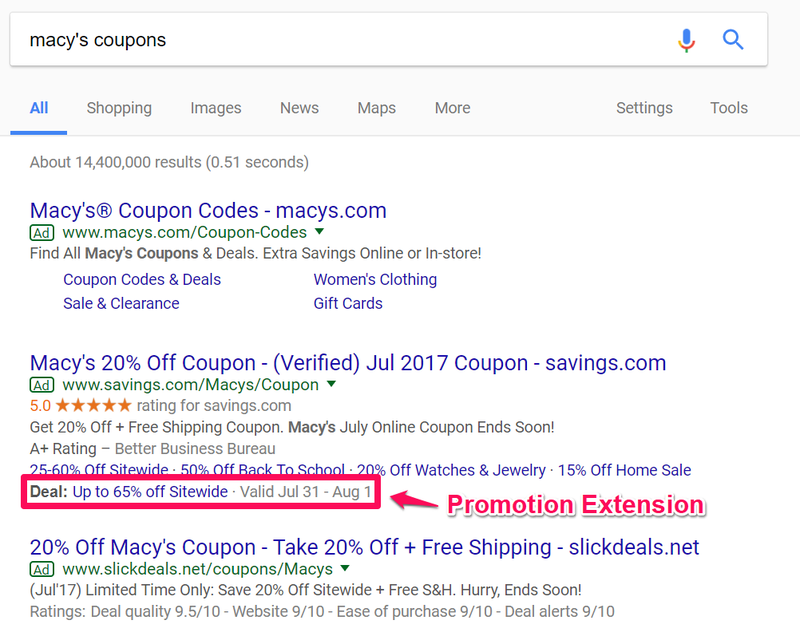 Promotion extensions will likely be officially launched in the coming months, but for now, we’ll focus on creating them within the beta AdWords UI. Step 2 – It will default to a view of any active “Ads.” Select the “Extensions” tab instead. Step 3 – Select which level (Account, Campaign or AdGroup) you would like to create promotion extensions for. If the sale is site-wide, Account would be appropriate. If there is a different sale for each campaign, then the Campaign level would be the best choice by far. Step 4 – Create a new promotion extension or use one that you have created in the past. Step 5 – Select the occasion you want your promotion or sale tied to. Use “None” as an option if your sale isn’t tied to a specific holiday. Step 6 – Select the “Promotion Type”. The example uses “Percent Discount”, but we can also use “Monetary Discount” as another option. Step 7 – Select the “Item” that the promotion applies to. There is a 20 character limit for this portion. Step 8 – Select the “Final URL”, or the landing page you want users going to when they click on the Promotion Extension. Step 9 – Select the “Promotion Details”. This can be a specific promo code, or “On Orders Over” a certain amount. Promotion extensions also provide an option to set scheduling for the promotion. In the example above, our promotion extension would start a month before the sale goes live and would only run between 6 AM and 8 PM, Monday through Friday. Extension scheduling isn’t required, but it can be a useful tool for targeting the right users. Promotion extensions are still in beta (for now), so some of this information may change. If you have access to the AdWords UI beta, I recommend testing them out to see what kind of results they generate. Let us know in the comments about your successes and failures. If you’re struggling to implement promotion extensions or other AdWords features, feel free to drop us a line! We’ll get you pointed in the right direction. Is there a way of using this type of extension for sites that don’t have an eCommerce store… it’s a retailer without purchasing online.. we want to utilize this for foot traffic. Any way of doing this, and then the landing page has an image of the coupon? That they print and take to the store?